This edit is intended to satisfy fans who weren’t happy with the film. It’s still not 100% faithful to the book, but it’s as close as it’s going to get. 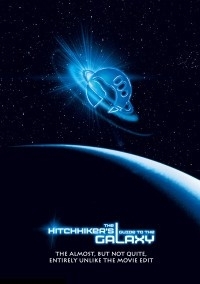 To create a version of The Hitchhiker’s Guide to the Galaxy that’s as close to the book as possible. I’m a huge Douglas Adams fan, read everything he’s written many times over, and spent more money that I’d like to admit on the various incarnations of the Guide. I’m probably in the minority in that I actually liked the film, including most of the changes to it. With this edit, I wasn’t too sad to see the Vogsphere and Viltvodle VI bits go, but the Point of View Gun was a great bit. It would’ve been nice to keep it, but if it’s going to be faithful to the book, it had to go. This also means that the shootout at the end had to go as well, which in turn makes the ending to the edit feel somewhat abrupt. It is what it is. It’s safe to say that Douglas Adams would’ve hated this edit. He always saw the Hitchhiker’s Guide to the Galaxy as a constantly evolving story and almost all the changes to the movie were his. But this edit is intended to satisfy fans who weren’t happy with the film. It’s still not 100% faithful to the book, but it’s as close as it’s going to get. - The Answer no longer gets revealed 42 minutes into the movie. You win some, you lose some. - After they engage the Infinite Improbability Drive to travel to Magrathea, Zaphod’s and Trillian’s clothes change and Zaphod has an odd helmet on his head. Must’ve been a strange effect of engaging the Drive. Those are the major ones. There are various other minor elements that were not in the book, but retained in the edit. I have not read the book but I really enjoyed this edit. I see no reason to watch the original. One of the things I enjoy about this community and art form is it has introduced me to movies I might not have otherwise seen.